This entry was posted in Gardens Online, Varieties and tagged beans, community gardens, homestead #24, irrigation, peppers, tomatoes, valley girl. ← The bulbs are hard at work. Yeah!! My seedlings look a lot like yours, and are still in the kitchen, far away from being ready to be planted. Perhaps sometime after St. Patty’s Day, I’ll settle them into their dirt beds. I’m looking forward to buying a couple of Roma varieties that are further along. I want to can this year. As for soil, I just stole 20 bags off the curb last Monday. My first keyhole garden is officially under construction. Hopefully we won’t get a drought again, but if we do, I’ll be ready. PS — Hope that little bun is bigger than those maters. DH stole a bunch of good leaves off the curb for my new beds! I just ran out of fully cooked compost already. This little bun is trucking right along 🙂 Already head down months early and big enough to kick my ribs while it punches my hips. Makes me laugh every time. I’m a little envious of your early plantings. I won’t start my tomato seed until next week and they can’t go into the ground until the end of May when they get planted into our summer garden in Maine. The biggest difference I see in our plantings are that before my tomatoes go into the ground they will be almost 30 inches tall. Of course, I will take off the bottom branches and plant them deep so they won’t be that tall once planted. These little guys won’t go in so small. They’d be eaten by snails overnight for sure. I’ll get them about 4″ tall, plant them up to their necks in bigger pots, get them about 6″ tall and plant them to their necks outside. They just are growing so much slower this winter than two years ago! Isn’t it funny how we grow so differently where we are and yet so much the same…I keep transplanting like you do. I try to slow my growth down until I can take my plants to Maine to put in my garden because I can’t let them get taller than the height allowance I have in my car but I only have 130 days for my growing season. I’m still a couple of weeks from starting seeds…sometimes I miss gardening in the South! Everything looks so great! We’re still under a foot of snow here 😦 I was thinking about starting some seedlings in the house, but I think I’ll just wait and plant directly in the garden. I don’t have any special lights to help them grow and my basement is probably too dark and cold. If I put them by the large window upstairs, I just know the kids will end up destroying them! It took many years of practice to figure out how to keep my seed trays in the front window AND safe from our cat and dog. Hopefully all of your snow is freezing out the bad bug larvae underground and you’ll have a prosperous year! every year is different isn’t it?! some years I seem to sow too early and then spend ages waiting for it to be warm enough outside and things like tomatoes get leggy, then other years (this one!!) I haven’t sown any yet so like you I will probably make a trip to the garden centre and pick some plants up. And I thought my cosmos were about to bloom…and they did not enjoy the freeze last night. Hopefully they jump back! 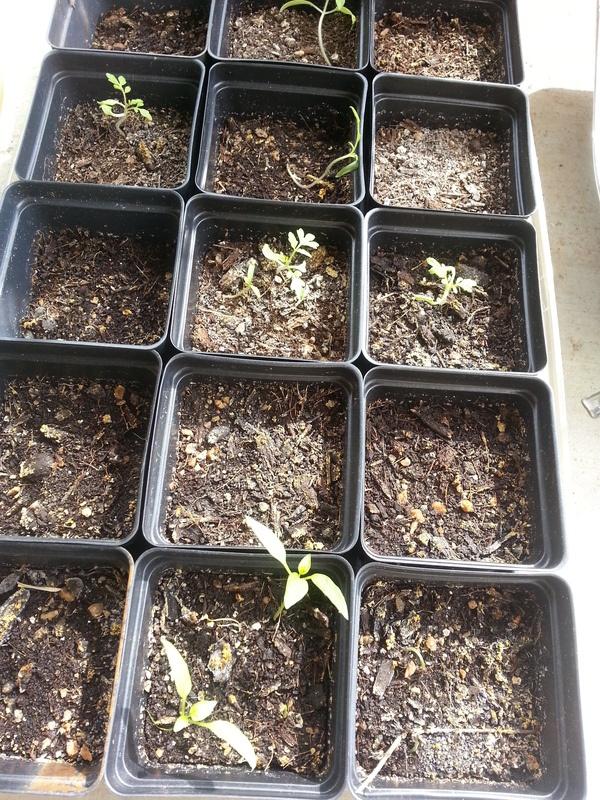 How envious I am of you being able to set out tomatoes already! I’ve got about a month to go.